How is custody determined in Orange County CA: Child custody orders are an important part of family law when a child’s parents are unmarried, legally separated, or do not agree on how to raise a shared child. Determining the terms of a child custody order can be complicated and time consuming, but it does not have to be! 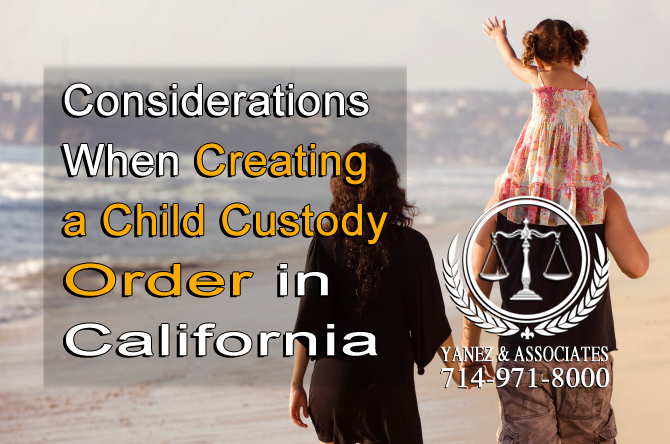 The state of California allows child custody orders to be created in numerous ways, but every custody order needs to meet the standards set by the state. In order to be legally valid, a custody order needs to be in the best interest of the child, and it needs to be signed and approved by a judge. When creating a child custody order, there are two basic pieces: where a child will spend his or her time and how decisions will be made regarding the child’s life. These pieces are called physical custody and legal custody, respectively. Physical custody is the part of custody that says where a child will live. It can be granted solely to one parent or jointly to both parents. Usually, when one parent is granted sole custody, the other parent will be granted the right to visitation. You may choose to create your custody order on your own, in which case you need to consider visitation if you determine that sole physical custody is in the best interest of the child. Legal custody is the part of child custody that says who will be responsible for making important decisions about the child’s life. These decisions can include where the child will go to school, the child’s religion, in which extracurricular activities the child will participate, when and where the child will go on vacation, where the child will receive medical care and which care will be administered, and how the child’s mental health will be cared for. Like physical custody, legal custody can either be granted solely to one parent or jointly to both. In many cases, this can depend on the parents’ relationship with one another. Because both types of child custody can be granted either solely to one parent or jointly to both, there can be a lot of variation from one child custody order to another. Remember that just because physical custody is granted solely to one parent does not mean that legal custody will also be granted solely to one parent, and just vice versa. Each piece is determined separately and independently. 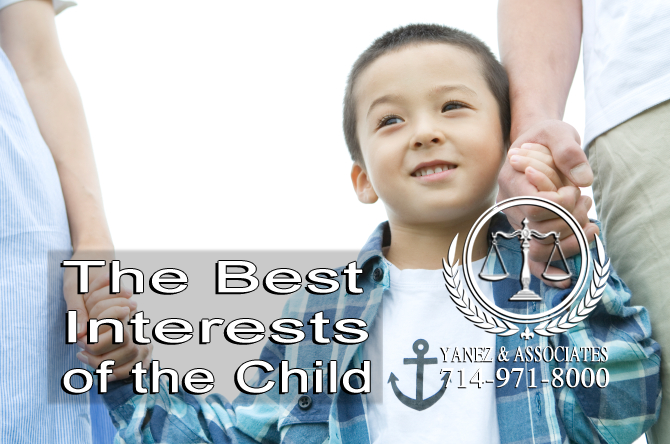 Child custody is always meant to provide for the best interest of the child. 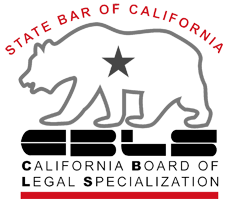 This legal standard in California can vary from child to child, depending on things like the child’s age and relationship with each parent. Consider the child’s needs for love, protection, guidance, a healthy diet and environment, medical care, rest, and education. A child custody agreement does not have to stay the same as a child grows up, or be the same for children of different ages. You will likely have the opportunity to modify your child’s custody agreement as his or her needs change. However, it is important to make your custody order as detailed as possible so that you can avoid confusion and violations of the order. How can we Create a Child Custody Order that will be in the best interest of our Child? There are several ways to create a child custody order. You can opt to create it on your own, with the help of your spouse or your child’s other parent, through a form of alternative dispute resolution like child custody mediation, or you can allow a judge to create your custody order in court. 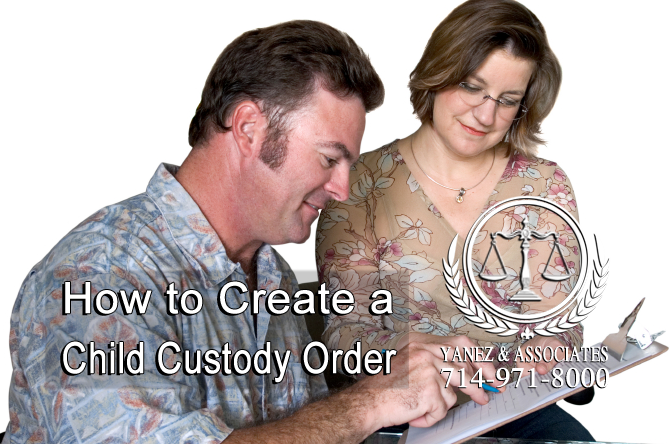 There can be numerous benefits to creating your own custody order on your terms instead of going through the courts. Usually, working with your spouse, especially through child custody mediation, allows you to create a custody order that fits your needs and the needs of your child better than a judge can, simply because you know and understand your situation better than a judge could. Avoiding a trial also means that you will likely save money, you can keep your child out of the courtroom, you will have more of a say in the outcome of your custody order, you are more likely to know and understand all of the terms of the order, and both you and your child’s other parent are more likely to follow the terms of the custody order once it is signed and legally put into place. Child custody mediation is a form of alternative dispute resolution where you and your child’s other parent work together with a third party mediator who has been trained in mediation. The mediator’s job is to remain neutral, refrain from providing legal advice to either party, and to facilitate a healthy discussion between the two parties that helps both parties reach their shared goals through compromise and working together. Usually, attorneys are not allowed to be present during mediation sessions, but both parties are free and encouraged to meet with a child custody lawyer and other experts outside of the mediation sessions. You can also choose to work out a child custody agreement on your own, or working with your spouse without the assistance of a mediator. If you and your spouse both hire lawyers and you choose to meet together with your attorneys, you may work through your issues through a process called collaborative law. Usually, this is done as part of a divorce or legal separation. In some cases, it is not a good idea to try to work through your custody issues on your own. This is especially true if domestic violence or child abuse have played a role in your life or your child’s life, especially when it involves the child’s other parent. In these kinds of cases, it is always in your best interest to let the court know what is going on and to take the time and effort to have a custody agreement created that is in the best interest of your child rather than trying to do it on your own, or allowing a violent or abusive parent to have a say. The best interest of the child is a legal standard in California that is meant to be unique based on each individual child. Generally, the child’s best interests depend on several factors. • A child’s best interest can also be based on other factors as the court sees fit because every child is unique. Because many of these factors, and other factors, can change as a child grows older and his or her life changes, a child may outgrow his or her custody order. If this happens, either parent may apply to have the custody order modified so that it keeps up with the child’s current needs. 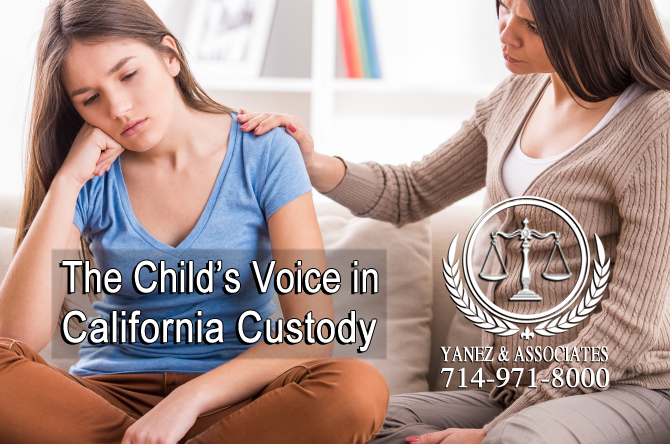 How can my Child’s Voice be heard in a California Custody Case? Under California law, a child’s voice can play a role in a child custody agreement. When parents choose to determine child custody outside of the courtroom, the parents may decide to ask the child for his or her opinion or not; however, the child will not appear in court, because the parents will likely not appear in court either. When custody is determined in court, the courts may consider the child’s opinion. According to California law, children who are at least 14 years old and who wish to share their opinion on their own custody order should be heard in court in an environment where the child is safe to share his or her own opinion. The child’s opinion should not be the only thing considered when determining custody. Children who are under 14 should not be discouraged from sharing their opinion, as long as the court determines that it is in the child’s best interest. Need the help a an expert custody attorney in Orange County? Often wondered how is custody determined in California? Contact us NOW for a free case review with one of our custody attorneys! If you have questions about determining child custody, it is always a good idea to contact a California child custody lawyer. Your attorney will be able to help you understand how the law can be applied to your case and help provide the best life for your child and your child’s family. At Yanez & Associates, we offer free initial consultations. Contact us today to schedule yours! 1 How is my Child's Custody Determined in Orange County & Los Angeles, CA?